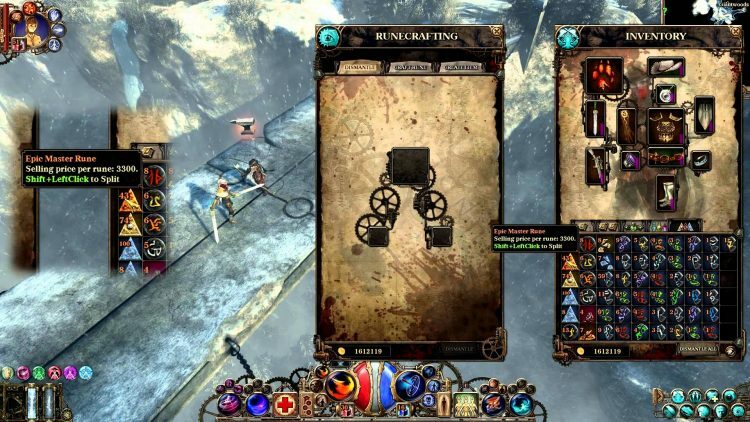 NeocoreGames have revealed a new video that shows The Incredible Adventures of Van Helsing 2 Runecrafting being used to enchant items in a more specific way compared to the prequel’s Forging system. In the lands of Borgovia, a hunter is only as good as his tools, so keeping your weapons sharp and your armour strong is what the Runecrafting system is for. Step: 1 Dismantle your item. Note the new GUI at the bottom? In addition to improving endgame replayability, this Runecrafting system allows hunters to create items that did not previously exist, such as damage reflecting collar for your Chimera, a dress for Lady Katarina or a rare anti-vampire gun perhaps? So what does one need to craft? Fragments, lots of them, you gain two types fragments when you dismantle an item for free, but why free? What’s the catch? Unlike saving the world of Diablo’s Sanctuary, saving Borgovia the first time round has its benefits right? The rarity of the item and its properties determines the exact number and types of fragments your hunter can get e.g. a unique item can yield some interesting fragments compared to a non-magical item. Step: 2 Turn your fragments into runes. Using the Forging system in the Incredible Adventures of Van Helsing, you could min/max your gear with the perfect enchantments if you rolled nicely. Therefore you should use any poorly rolled enchanted items you carry over to obtain a total of 20 fragments, two of each type (item and property). The catch is that in order to turn them into either an Enchantment or a Master Rune, you must pay some greedy Dwarf a lot of gold, including those 20 fragments! Otherwise your runes might end up like the first sword you forged. Step 3: After dismantling your item and combining fragment, you can craft an item with your runes. When adventuring, packing lightly helps save space for loot for all that gold you’ll need later. Fortunately fragments are stored in a separate tab, after all, how much loot can Lady Katarina put down her dress? On 6 March at 11 AM PST, NeocoreGames will be streaming The Incredible Adventures of Van Helsing II over on their Twitch channel if you want to find out more. In April, we’ll also be bringing you some lovely info direct from Neocore. Let us know what you want to find out from NeocoreGames in the comments below and we’ll be sure to probe them further. Col: Showcasing combat? It’s a bold strategy Cotton. Let’s see if it pays off for them.